Though steam mop is a creative floor mop yet it requires certain prep work in order to obtain clean floors. Steam mop provides much better cleaning system in comparison to bucket and mop system for cleaning floors. In case if you want to be happy with your purchasing then be aware of the guidelines for using a steam mop. There are a variety of steam mops that are available in different sizes, styles and amount of generation of steam or power and manner of attachment of mop head. There are some that have much better features in comparison to others. Independent of models, apart from features there are various other points of consideration. It is very important to vacuum the floor before steaming it. 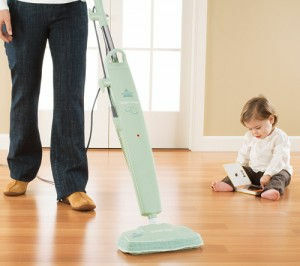 An alternative of vacuum is sweeping that has a good capability of sucking things from cracks like dust, lint and other debris on a surface that might result in making the mop head dirty. After vacuum, the floor is prepared for steaming. There are certain steam mops or sweeper tools available in markets that have the dual function. Though they can be easily handled and perform reasonably yet you cannot avoid vacuum when it comes to cleaning of small areas or messes. Regarding complete floor vacuum has the capacity of cleaning a lot of dirt before using a steam mop, due to this less dirt exists on the pad of mop, thus it provides better cleaning. Maintenance means that steam mop should be used when the floor is not very dirty. In case if your floor is soiled heavily then make use of hot steam for smearing away the dirt from the floor. The result would not be the same as desired. Steam mop works perfectly if the floor is being maintained regularly and requires little cleaning. In case if you have bought a new steam mop then first clean up the floor in the old manner and then make use of the steam mop routinely as you do. Floors can be often cleaned up using the steam mop as it requires less of work and time, and it would save a lot of it in the long run. Is it very important to have more of mop pads? More than one mop pad may be used based on the requirement as you do not want the dirt to smear around while the steaming is done on the floor. Basically, I prefer to start with the laminate floors and then move ahead to vinyl and keep changing the pad as per the need and vary especially when I reach the entrance which means faux tile to have great shine without smear. Steam mops are available at reasonable rates; they are basically well washed in the washer and then are hung for drying especially in case of microfiber. In order to be aware of all the instructions that need to be followed while taking care of the accessories and steam mop do refer to the product manual. To ensure proper cleaning do change the pad of mop when it is dirty. After the use of steam mop do remove mop pad from streamer for laundering. It is not one of the important needs but in general the care of floor. The steam mop should be used over the sealed floors as an excess of moisture would spoil some of the surfaces. In case if you are doing anything else do not leave the steam mop plugged in, moisture can be collected over the pad that might spoil the surface of the floor. One of the best rules of thumb can be used for testing hard surfaces, in case if you are not able to recognize it keep on moving the steam mop. Do not permit it not to occupy any of the spots. If you have made sufficient use of steam mop, then let it cool down over the sealed surface and remove the pad as fast as possible.